The two white shapes are in one layer. The black "i" is a text layer on top of this. How can I make the "i" be a cutout inside the white layer, that allows the transparent background to show through? I can't find any tutorials online that demonstrate how to do this. 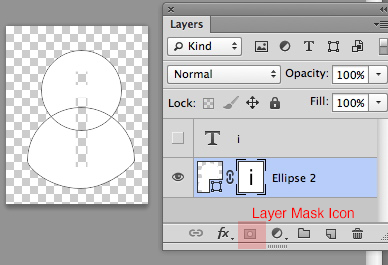 cmd+click (Mac) or Ctrl+Click (Win) the layer thumbnail (the T) for the i in the Layer's Panel. This should load the i as a selection. 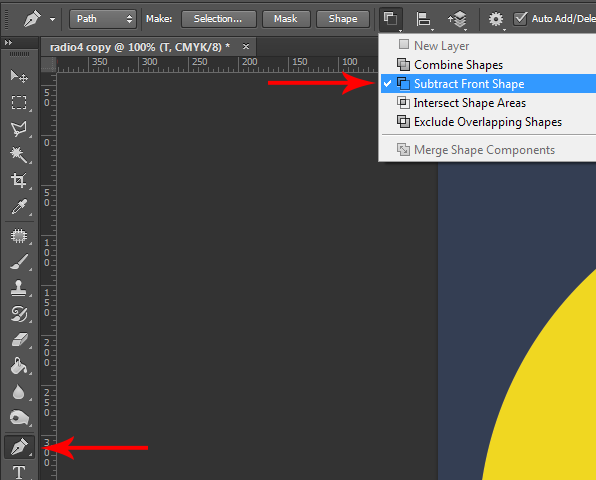 Highlight the shape layer in the Layer Panel. Click the layer mask icon at the bottom of the Layer's Panel. Turn off visibility for the text layer. Scott's method will work (and probably gets the job done perfectly in this case), but this can be done in a way that retains the scalable vector property of the text, which the layer mask doesn't. And considering that the white area is a shape, the whole thing would be scalable to any size. Right click the text layer and select "Create Work Path"
Right click in the image and select "Create vector mask"
Not the answer you're looking for? Browse other questions tagged adobe-photoshop cs6 mask or ask your own question. How to cut out objects with background layers and effects intact? How to cut out a shape from another shape that has effects?